School Closes on Tuesday 22nd December for the Christmas Holidays, and re-opens on Wednesday 6th January 2016. Xmas Fair Videos now online ! All classes took part in the annual Christmas Fair on 10th December 2015. Congratulations to all the boys and girls, and their teachers, on their wonderful work. 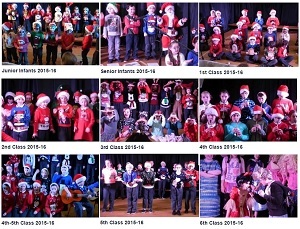 Videos of each class performance can be found by clicking HERE or on the image opposite. Our 3rd class will be taking part in a musical education programme called “Peace Proms”. We will be performing at the RDS DUBLIN on February 6th 2016. The children will take place in a workshop on 12th January in preparation for the event. Peace Proms is recognised as one of Ireland’s most important Arts Education initiatives, providing outstanding cultural opportunities for young people while promoting peace, unity and tolerance through music. It is supported and endorsed by the Department of Education and Skills, the Department of Arts, Heritage and the Gaeltacht, and the Arts Council of Northern Ireland. 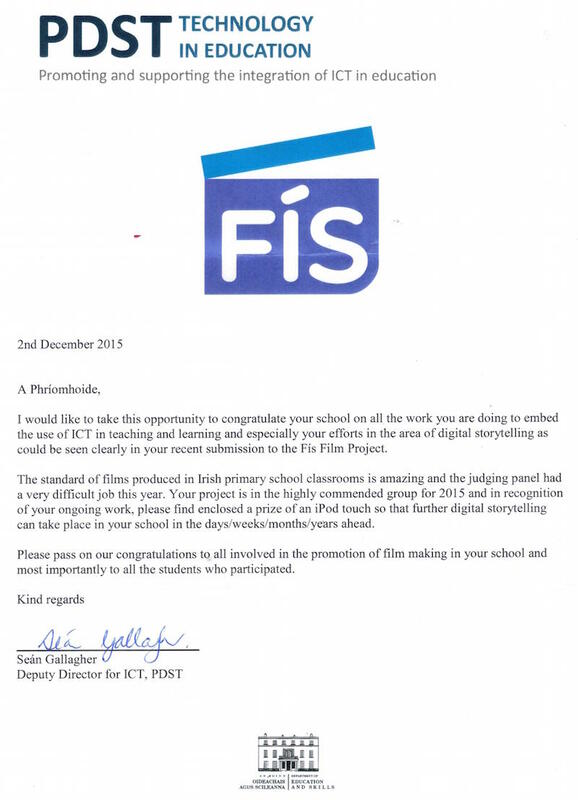 As this is a first for Rathmore N.S., we would like to thank Ms. Collette Larkin, Ms. Gillian Meeneghan and Ms. Margaret Maher for giving their time for this project. Good luck to all involved. They are priced at €15 each or €50 for a family of 4. I would like to pass on my thanks to the members of the Green Schools Committee from your school who gave a wonderful and very informative presentation to our Community Café on Fair Trade and the products available for sale in Ireland. We were all very impressed with the amount of work the children have put in to researching Fair Trade and spreading the word within your school and then to the wider community by calling in to the Community Café. The Posters on display were very colourful and we were all amazed at the number of products the children had collected which are Fair Trade. The Banana Bread, Chocolate Biscuit Cake and Cookies that the children made for us were very tasty and enjoyed by all. We tried the tea and coffee and compared them to the non-Fair Trade products at the Cafe. So we not only got to see and hear what Fair Trade is all about we also got to taste it as well. After the children had left the Hall, there was lots of chat about Fair Trade and most of us surprised at how many products are Fair Trade and when people arrived later for the Café the information we had picked up from the school children was passed on to them. Once again thank you for all the hard work and effort the Green Schools committee put into today’s presentation. We look forward to seeing you in January to see how much more we know about Fair Trade.